This has been a bit of an odd winter for us, with abnormally warm temps that suddenly dip into the very low double-digits. I find that with the swing in temps, my cooking/baking as well as eating habits have been jumping all over the place, too. So when the weather turned cold this weekend, I took it as an excuse to bake up something hearty. I turned to my "to-try" list and decided to make a batch of Revel bars. And how could they not be drool-worthy when Revel Bars are basically oatmeal bar cookies with a chocolate fudge-like center! You make a relatively basic oatmeal cookie dough, press two-thirds of it into a baking pan for the base, then make a simple chocolate fudge layer by melting sweetened condensed milk with chocolate chips and butter. The fudge gets spread over the cookie base and then you dollop the remaining oatmeal cookie dough on the surface before baking it altogether for about 25 minutes. I suggest starting these early in the morning because you need to allow time for cooling. The cookie bar needs to cool completely in the pan so the fudge layer sets up and the bars are easy to slice. When they're finally ready, I think you will revel in these as much as we did. The cookie bars may be rich but they aren't achingly sweet. I adore the texture - the oatmeal cookie portion is chewy while the fudgy layer adds an extra dimension of richness, creaminess, as well as chewiness of its own. 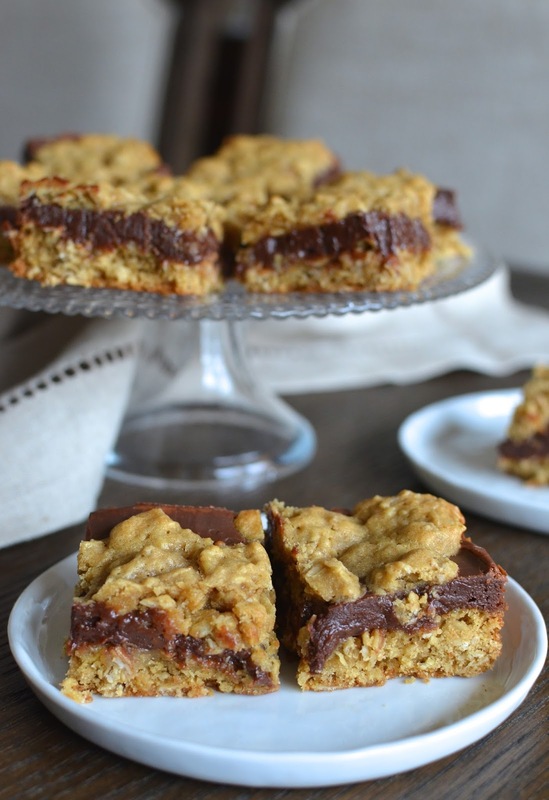 These are fudge oatmeal cookies in bar form and great for a crowd, for sharing in general. There's something about bar cookies/desserts...somehow, they're almost always good and generally rich. These Revel bars were aptly named and were a hit with us and friends we shared them with! While these oatmeal-fudge cookie bars have 3 layers, the bottom and top come from one oatmeal cookie dough and the center layer only requires melting a few ingredients together on the stovetop. For my recipe (which I based off of this one though I made half the amount and tweaked a few things, including using less butter in the filling), press about 2/3 of the oatmeal cookie dough into the bottom of a lined 8x8 inch square pan. I find using a small offset spatula to firmly press the dough out works well. Then, spread the chocolate fudge filling evenly over the base layer. The sweetened condensed milk, melted with dark chocolate chips and a tablespoon of butter, quickly gives you that fudgy consistency that will firm up after baking. Finally, take the remaining oatmeal cookie dough and place mounds of it on top of the fudge. You want to leave some of the chocolate showing. The cookie dough will spread a bit as it bakes and after 25 minutes, the top should be golden. Let cool in the pan completely before removing and slicing into bars. Then, it's time to dig in and savor a piece or two! We didn't have to shovel snow this past weekend but with temps dropping down to around 10-degrees in the evening, we warmed up - and cheered up - by eating a revel bar or two. It worked wonders! Lightly grease an 8x8 inch square baking pan and line it with parchment paper, allowing for overhang on 2 sides (this makes the bars easy to lift out later). Preheat oven to 350 degrees. In a bowl, whisk the flour, baking soda, and salt together. In the bowl of a stand mixer fitted with the paddle attachment, cream butter and brown sugar together for about 2 minutes, until light and fluffy. Add egg and vanilla extract, beating for another 2 minutes, scraping the bottom and sides of the bowl as needed. Add milk and blend until incorporated. On low-speed, gradually add the dry ingredients and mix until incorporated. Add oats and mix until just combined. In a saucepan over medium-low heat, warm the condensed milk, chocolate chips, and butter until just melted. Stir in the vanilla extract. To assemble the bars, press 2/3 of the oatmeal cookie dough mixture evenly into the bottom of the prepared pan (I find using a small offset spatula to press, then spread, the dough works well). Take the chocolate mixture and pour it on top of the crust, spreading evenly. Then take the remaining cookie dough and place small dough balls over the chocolate layer (you want some of the chocolate to show through and the cookie rounds will spread a bit during baking). Bake for 25 minutes. The top should be golden when done; if the top starts to get overly brown, cover the pan with foil and continue baking. Let cool completely in the pan, as the fudge layer needs to set. Once completely cooled, remove from the pan and slice into bars. You know what, I smiled reading the first paragraph. Here, the weather is very moody too. In one day we pass from spring to winter and vice versa. haha - thanks for that! : ) It's freezing here today but the fellas are fortifying themselves with food and cookie bars and out for another walk as we speak. I totally understand what you mean - the weather has a huge impact on our moods and feelings. I try to soak up the sunshine. Luckily, it's freezing but very bright this weekend. Let's hope for more sunny days. I'm doing a quick conversion based on a weight chart from King Arthur Flour (http://www.kingarthurflour.com/learn/ingredient-weight-chart.html). Accordingly, 1 stick butter = 113g; 1 cup brown sugar = 213 g; 1 1/4 cup flour = 150 g. I hope that helps. You can see the chart to double-check. Thanks! These look amazing. I'll be sure to check out the peanut butter version too! I'm sure Tricia's PB version taste amazing! These would be a hit in our home too. They look fabulous, Monica. I finally got to try them...thanks! Why haven't these been in my life…thanks so much for sharing this delicious looking dessert. These look insanely good! Soft and chewy oatmeal bars of any kind are my weakness! Love the fudgy center! These would be such a hit at our house - and the peanut butter ones sound awesome as well! They look perfectly delightful for an evening snack. I wish I could take a bite of your peanut butter version, Tricia. I'm sure they're so good! And you're so right about these being good to make, eat, pack, share, etc. Fun little bars I'd like to have on a picnic. We'll have picnic weather again soon. Rainy here today but back to 60's and sunny tomorrow. Yay! Condensed milk is an easy shortcut when it comes to making a simple fudge. I grew up around a good amount of condensed and evaporated milk so just the smell is nostalgic. :) Thanks, Adina...enjoy the week. It's definitely been a crazy winter!! I can't keep up with the weather changes! OMG do these look amazing or WHAT. I would devour them all! 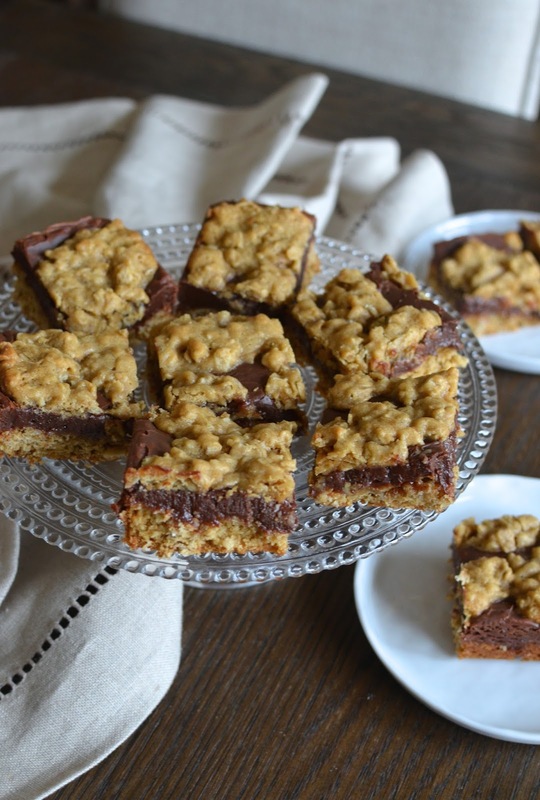 These oatmeal fudge bars look absoluelty stunning and super yummy. Peanut butter + chocolate + oatmeal are a hit in my dictionary. Will try them with my little one. I am sure my little one devour them. These bars are right up my alley! I will sure check the peanut butter ones! Oh Monica, these bars looks awesome...chewy oatmeal and creamy fudge chocolate layer in between...detectable! They are hard to resist, Juliana. Stay well! These look beyond amazing! So, so yummy! We've had such a weird winter too. We live in Buffalo, NY and have barely had any snow. It's just not right!